Adjusting the voltage changes the color, down for blue tones and up for a warmer look—so a single lamp can replicate the glow of sunset or the blaze of high noon. Best of all, plasma is more energy-efficient than fluorescent without the sallow-making glow. Checked out Hive Lighting website. Apparently their BumbleBee flood will produce 1.1 fc/watt @ 5 feet. A Mole 407 will produce 0.7 fc/watt @ 5 feet. That is an efficiency increase of 60% (not as much as fluorescen)t. They have a high CRI value but still produce spikes/notches at certain color frequencies. It appears the power savings is in the reds produced (and accompanying infrared). It would be fun to play with one of these for a while and see just how comparative they are with tungsten or HMI. But just having flicker free, full spectrum, daylight range light with that intensity on house power is HUGE for indie shooters. 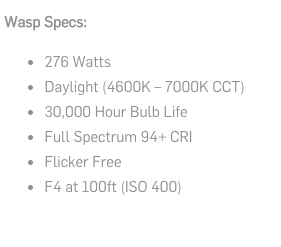 A single Hive "Wasp" Par pulling 276watts of power kicks-out the equivalent of a 600w HMI. You could put 7 of these on a single circuit, and light a pretty big scene even with heavy diffusion. No need for a generator. Smaller and more lightweight by comparison to the HMI's. If they can get the Wasps down to $1000-$1500 each... Game over man, game over. Not that $2500-$3000 is a bad price, it's just that not a lot of indie shooters have 10k on hand for a lighting kit - but I think $4500(ish) for a 3 light kit of this quality and power would be pretty much irresistible to many. Really keen to see some tests with these. Good rental options and as you said, on domestic power. Cost balances out on not having to hire a tonne of spark gear and an experienced gaffer to deal with it all. Do they have any cheaper lower power options, like a 1k PAR equivalent. Or are they fully dimmable through a big range? Don't forget that plasma is organic technology that deteriorates over time. It would be interesting to have more information on the longevity of these lights. 30,000 hours according to the literature. I was recently involved in an indie project that used Hive lights both indoors and outdoors. Simple, fast setup and good amount of light output. We used them in both direct and bounce lighting. With that said, we still used other traditional light sources. Biggest benefit was not having to worry about blowing fuses while plugged into a normal household electrical outlet.